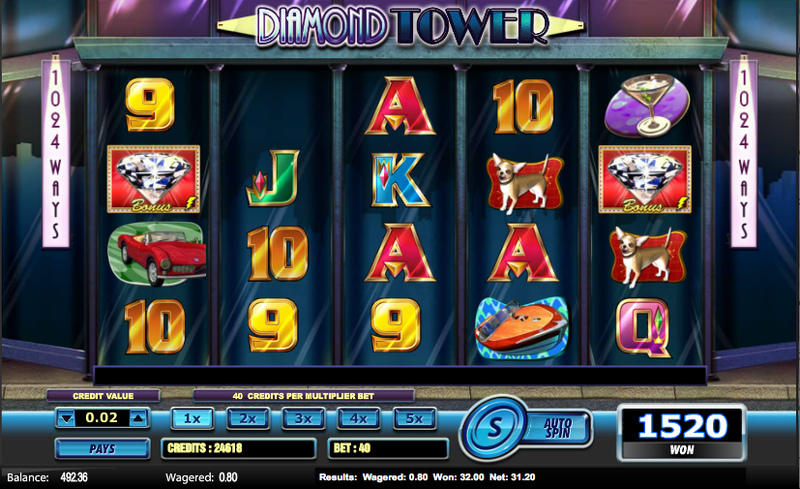 Some genres are particularly popular with online slots developers and crime is one such theme. We’ve reviewed lots of crime-related games in the past – you can view our top five here – and now there’s one more to add to the list. It’s from Amaya Gaming, it’s called Diamond Tower and it’s main protagonist is a foxy cat burglar. 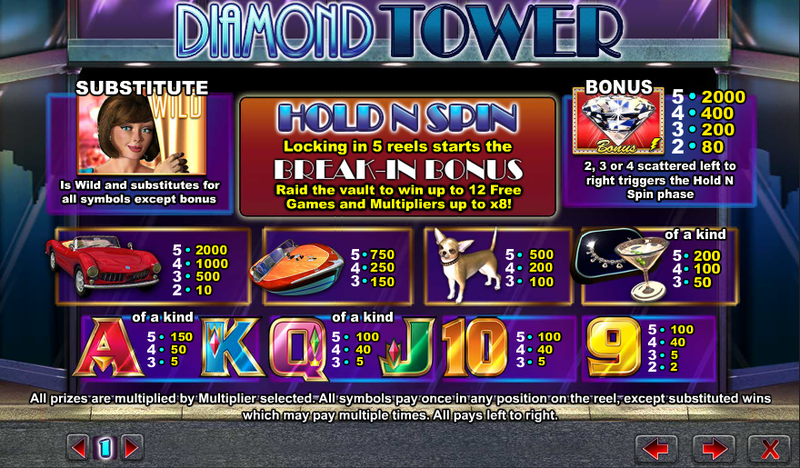 Diamond Tower plays out over five reels, four rows and 1024 paylines – they’re not really standard paylines though, any matching symbols on adjacent reels from left to right will win. There’s a distinct are deco theme to the game which you can see for yourself in the backdrop to the reels. There are some luxurious main symbols including jewellery, a cocktail, a small dog, a speedboat and a classic car. 9, 10, J, Q, K and A are the low values. The cat burglar herself is wild and she will change into her thieving outfit she helps make a winning combo. A giant diamond is the scatter symbol. There’s a bit of a process to go through before you actually win any spins and it all starts by landing two, three or four of the diamonds anywhere on the reels. This triggers the Hold N Spin phase which works as follows – triggering symbols become locks, freezing that whole reel. You then get three more spins to land more diamonds; get one and it will lock the reel and restart the spins. If you can manage to get all reels locked you will start the Break-In Bonus. You can see this in the video above; just pick a door from each level in turn, trying to avoid the red light. When you hit that light you will receive the number of spins and multiplier determined by that level. Now those spins are at last ready to start! You can re-trigger the bonus from within this feature. This is an entertaining addition to the crime slots genre; the graphics aren’t state of the art but they’re okay and the are some nice animations along the way. You’ll get lots of smaller wins from the 1024 ways to win.